Styling at Kudzu & Co. The photo shoot I styled came out this week in the April edition of Atlanta Magazine! Do you see there at the bottom in size 2 font? Photograph by (the one and only!) Christina Wedge and Styling by Yours Truly. Woo hoo! 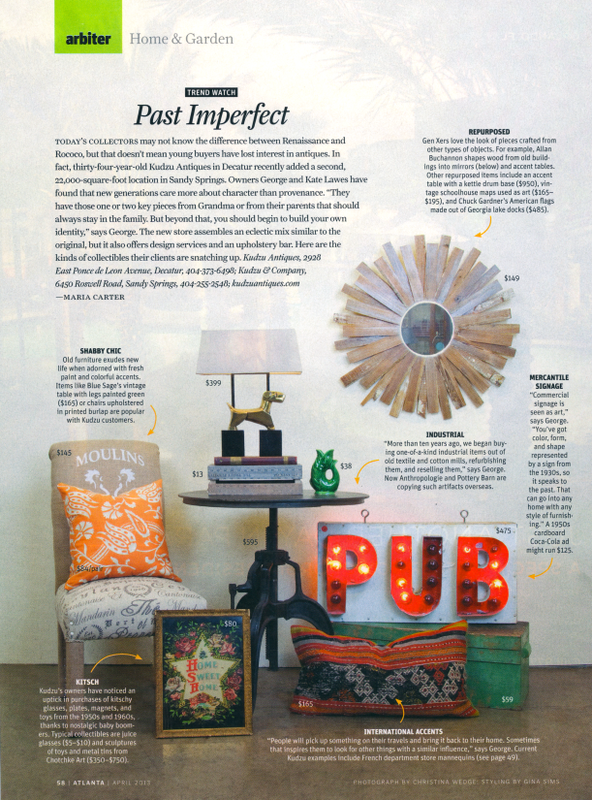 We did this shoot for Atlanta Magazine at a great shop in Sandy Springs called Kudzu & Company. The original Kudzu is in my neck of the woods and is one of my favorite places to shop for that great vintage find. The magazine wanted to showcase the store and incorporate 7 different design trends: international, shabby chic, midcentury modern, repurposed, mercantile signage, industrial and kitsch. This is what we uncovered down aisles and aisles of beautiful antique booths. That french mannequin completes me. Cover Shot - Look for it in news stands!